This pleated purse is a new Emma Makes design for 2012: sewn with a stylish combination of vintage and new materials that you've come to expect. This purse is a vintage floral taken from a dress. The pattern is cotton and covers both exterior sides. 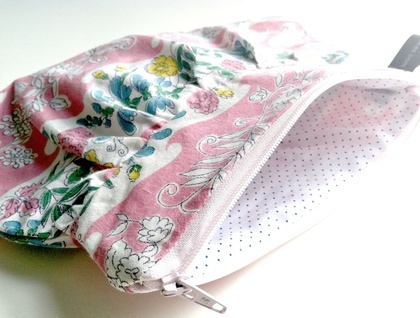 The purse is lined with a white/fine navy polka dot and closes with a baby pink new zip. Each purse is 19.5cm across the top and 18cm at the deepest point. The panel along the top of the purse is 4.5cm deep. 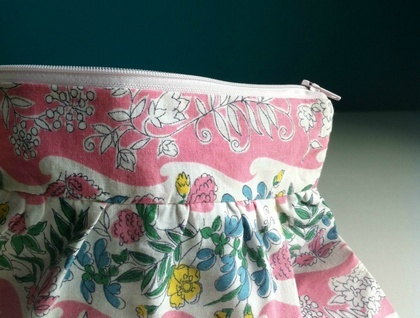 An Emma Makes pocket purse is great for cash and cards, your iPod, pencils or as a gift. 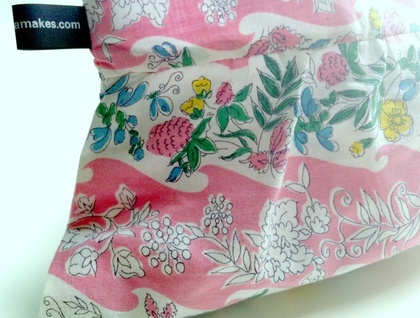 I source a wide range of vintage fabrics for my products in small lengths. Therefore, I have limited numbers of any one item in the fabrics you see. Everyone likes a present and I’m happy to wrap your purse and post it direct if it’s a gift. Just let me know by leaving me a note when you check out.